Prediction #2 gained relatively little traction but maybe that was because prediction #3 – blaming the situation on the cyclonic windstorm that occurred in early August – was so easy to run with. But hold on a moment. The melt-rate prior to the storm was such that a record was inevitable anyway – the storm only increased melt-rates for a few days. Furthermore, whilst such storms are indeed uncommon, the early August gale was not an unprecedented event. Who says so? Paul A. Newman, chief scientist for Atmospheric Sciences at NASA’s Goddard Space Flight Center, estimates that there have been about eight storms of similar strength during the month of August in the last 34 years of satellite records. And there’s a second factor: ice-quality (an often overlooked parameter), Claire Parkinson, a climate scientist with NASA, commented, “decades ago, a storm of the same magnitude would have been less likely to have as large an impact on the sea ice, because at that time the ice cover was thicker and more expansive.” Indeed. Two metre-thick robust pack-ice is a lot harder to disintegrate than the thin, slushy rubbish that this year’s storm had at its disposal. In summary, yes the storm was a minor factor in the magnitude by which the record was broken, but only because the ice was already in such a poor state. An impressive record minimum would have occurred, storm or no storm. Owing to past neglect, in the face of the plainest warnings, we have entered upon a period of danger… Winston Churchill, 1936. With regard to prediction #4, we had John Christy making claims about low minima in the late 1930s-early 1940s (the lowest minimum, in 1940, was in fact approximately 9.8 million square kilometres as opposed to 3.4 million square kilometres in 2012), although he didn’t get too specific, perhaps for obvious reasons. He was paraphrased by a Sunday Times journalist thus: “anecdotal and other evidence suggesting similar melts from 1938-43 and on other occasions”. Skeptical Science posted a detailed debunking of Christy’s claims early this September. Is this the same person here? Anyway, onwards. 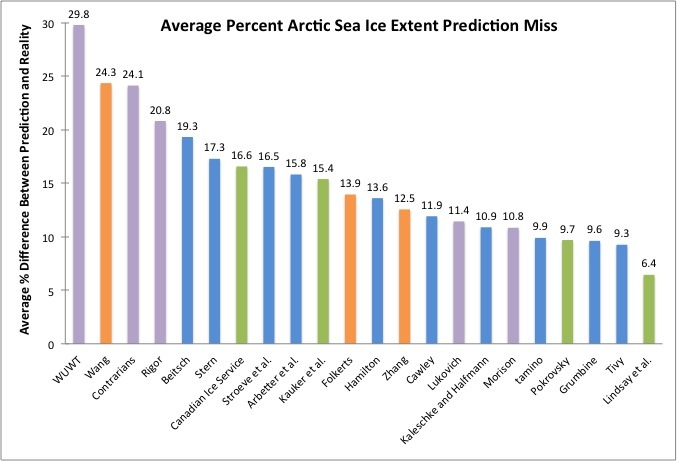 How about advancing the “it not being a global effect” (prediction #5) argument? One word: Antarctica. Suddenly, every fake-skeptic worth his or her salt had their eyes fixed on this gigantic ice-cube sat atop a pole-straddling continent surrounded by ocean. Note here that, in drastic contrast, the Arctic is an ocean surrounded by continents – the dynamics are completely different. To continue however: as luck would have it, there was a new paper to talk about on climate change in the West Antarctic Peninsula, largely based upon hydrogen isotope values from an important new ice-core (post and discussion at Realclimate). That was it, verbatim. A bit short, but there we are, left to draw our own conclusions. So what are we to make of it? 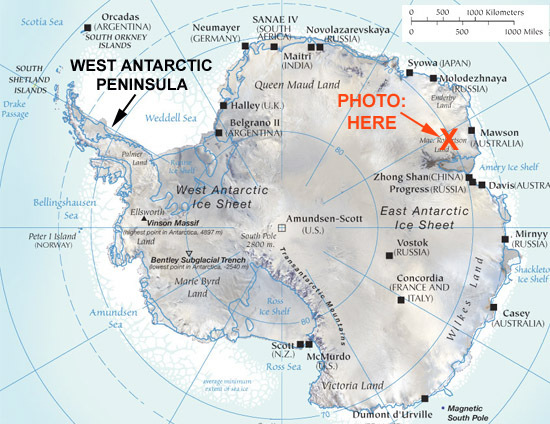 Was Anthony Watts seriously trying to tell us that the West Antarctic Peninsula suffers from an Urban Heat Island effect because a few hundred scientists hang out down there? The photo he used appeared to show a temporary field camp, something akin to the Everest Base Camp and hardly urban in nature. Whereabouts was it? And what does it have to do with a long-term temperature reconstruction based upon hydrogen isotopes from an ice-core? All very mysterious. The badly sited meteorological screen in your photo is at an Australian summer camp in the Northern Prince Charles Mountains, near Mt Jacklyn – in the background. 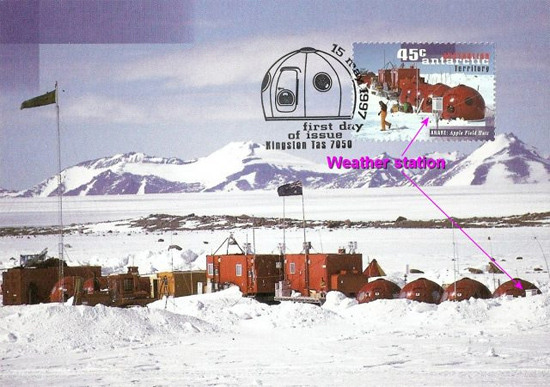 Temperatures measured here were for local information of pilots and field parties only – it is useful to have an idea of how many layers of clothes to put on before exiting your Antarctic shelter. Temperatures here were only measured for less than 2 months over a couple of seasons and have NEVER been used for any climate record. This photo was taken in the 1988/89 austral summer when I, and a colleague Andy, lived in the UNHEATED shelter nearest to the meteorological station. I didn’t realise that I was so hot that my body heat could influence temperatures measured on the Antarctic Peninsula, thousands of kilometres away. It must have been Andy!!! Thanks to Ian for clearing that one up! There is unequivocal evidence that Earth’s lower atmosphere, ocean, and land surface are warming; sea level is rising; and snow cover, mountain glaciers, and Arctic sea ice are shrinking. The dominant cause of the warming since the 1950s is human activities. How about the other arguments that Gareth missed? One I did hear reported over at Neven’s Arctic sea-ice blog was the claim that 450 more cubic kilometers of ice volume went away in 2010 (18,974 km3) than have so far this year (18,523km3), meaning – wait for it – that the ice is in “recovery”. Now then. If I were to melt a whole ice-cube in 2011 and then melt a half ice-cube in 2012 then I’d have melted less ice in 2012 but still have ended up with nothing. Fail. Anyone spot the flaws with this? Firstly, Arctic sea-ice is a feature specific to water. Secondly, it’s not the extent after melting, but before that is important, because it is the difference between the two that represents the amount of albedo-loss over the planet’s waters, albedo being the proportion of incoming solar energy that is reflected by a surface (as opposed to being absorbed) during, in this case, the Arctic summer. So that’s almost 4% of the surface area of Earth’s water over which the albedo value can undergo dramatic change. Albedo is expressed in values between 0 and 1; snow-covered sea-ice has an albedo of 0.9, bare sea ice has an albedo of 0.5 and open sea water has an albedo of 0.06. That means that snow-covered sea-ice only lets 10% of incoming solar radiation through into the water; bare sea-ice lets about half through but open water lets a whopping 94% of incoming solar energy in. 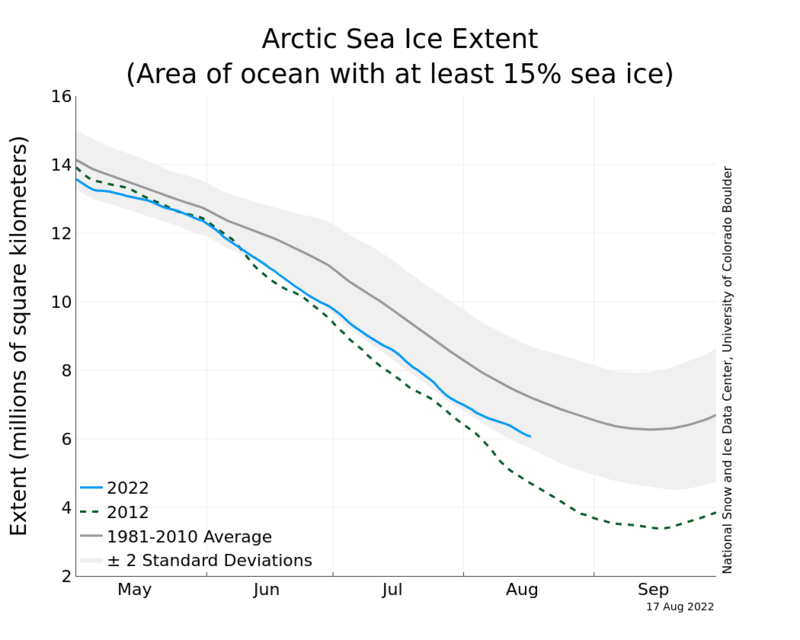 This year, the drop in Arctic sea-ice extent has been from a high of 14.44 million sq km to a low of 3.4 million sq km – a loss of over 75% of that useful high-albedo area. So forget about 0.6% – it is a meaningless figure! 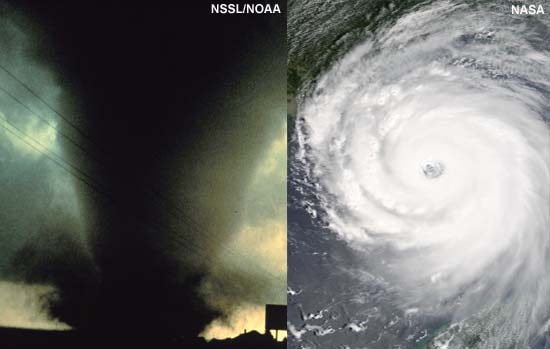 L: an ‘apparent’ tornado; R: an ‘apparent’ hurricane. 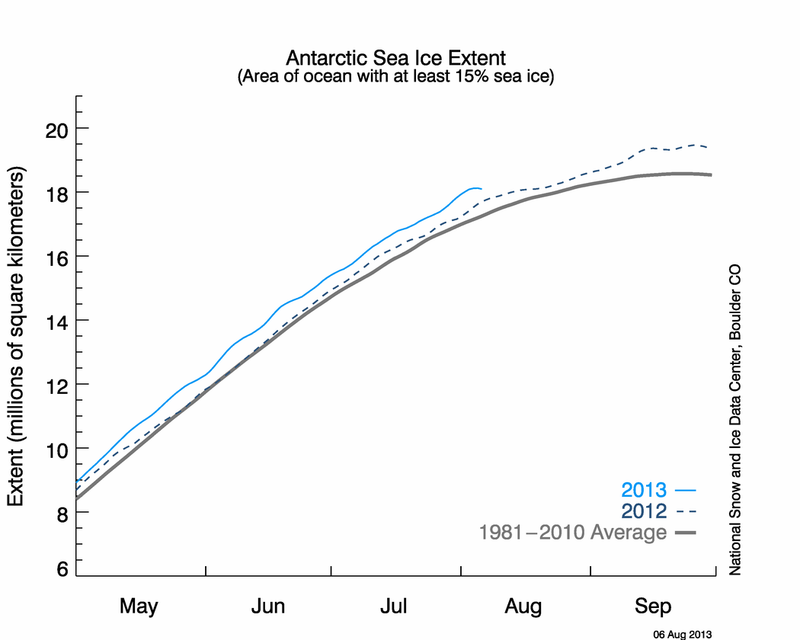 Now, can anybody tell me what is ‘apparent’ about this sea ice minimum record (below)? I’d say that was in-your face, don’t mess with me, full-on record meltdown, myself. The era of procrastination, of half measures, of soothing and baffling expedients, of delays, is coming to its close. In its place we are entering a period of consequences. Winston Churchill, 1936. To conclude, for most of the media world, late summer is the silly season. Unfortunately, in some parts of the blogosphere, it appears to have become a permanent state of affairs! But there’s one final prediction of Gareth’s remaining to be confirmed. 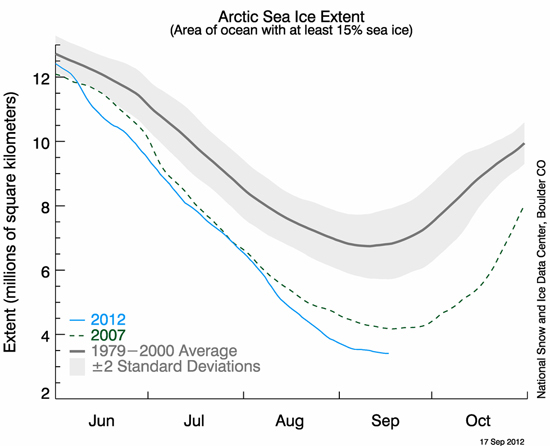 Will a ‘Stunning Recovery’ be widely announced as we head into winter 2012-13 and the sea refreezes, as it is supposed to? For the answer to that, only time will tell. The mental disconnect of the denial circus is sickening. The age of silly is indeed upon us, where thanks to the internet enabled power to self-publish any old yarn to the masses, we are confronted with ill educated but vociferous individuals who would have mercifully remained silent before. The acts of activism to deny climate change seem just as sickening as the act of the Texas cop who shot a wheelchair bound double amputee wielding a pen for failing to do as commanded…. When will the communal intellect emerge to get us out of this mess? 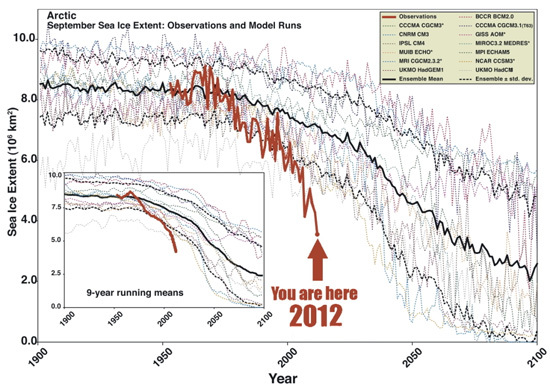 Does anyone know where you could find a graph or the data similar to the second last one in this post (you are here 2012 in bright red) for the Antarctic? My guess is that the range of variability for summer Antarctic extent is still within the range of model projects. Because though summer Antarctic sea ice extent has risen the rise has been smaller, plus the projections for Antarctic summer sea ice loss were less than those for the Arctic. 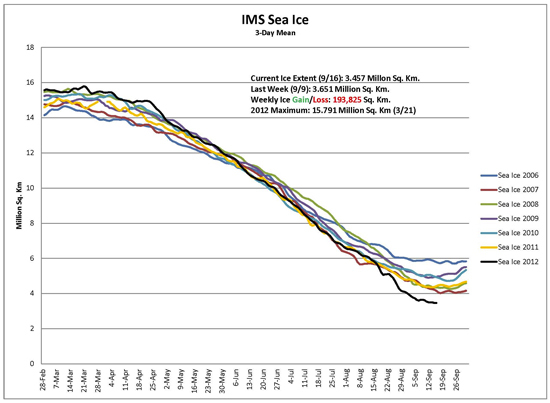 Will a ‘Stunning Recovery’ be widely announced as we head into winter 2012-13 and the sea refreezes, as it is supposed to? For the answer to that, only time will tell. For a sampling of the forces of dumb and dumber in the age of silly have a scan of the article and comments at the American ‘Thinker’…. Apart from Microsoft, HP, Yahoo, Google, NASA, Intel, nuclear power, putting a man on the moon, what have the Americans done for us? I wouldn’t have thought that that list represented the height of human endeavour by any means. Microsoft’s contribution was to market a substandard operating system – QDOS short for “quick and dirty operating system”, and a seriously flawed word processor “word”. HP used technology developed elsewhere, Google whose infringement on personal privacy is probably only exceeded by the GCSB, NASA – what has spending trillions of dollars on sending a man into space got to do with the relief of human suffering?, intel? well most of that is manufactured elsewhere, and nuclear power was mainly an international effort – read the “manhatten story” if you really want to know the truth. There is no way in Hell that we will avoid a runaway climate with so many idiots such as these voting for the twit. I doubt employees at Microsoft, NASA, et. al. read American Thinker. Indeed. Several prominent employees of NASA are doubtlessly routinely slandered at this amusingly titled site. I hope somebody puts this into the GOP presidential candidates bloopers collection. One of his most impressive videos, I’d say. And note the persistent inability to notice the volume issue, as animated in a very, very easy to comprehend manner in the video. Consult a volume chart some time, andy. Notice how andy finds fact “boring” – far more interested in flights of fantasy and fiction. Nonsense, Andy. While that storm was a mere long range forecast, ice watchers were speculating that it might have a dramatic impact – and it might astonish you to learn that nobody has ever suggested it didn’t. However, I most certainly did predict that “sceptics” might attempt to blame the new record entirely on that storm, and you (and Treadgold et al) are proving me correct (see #3 in the post above). Two uncomfortable facts for you: the storm itself was made worse because of the recent retreat in ice coverage (storms thrive on open oceans and strong temperature contrasts), and the ice was already thin before the storm, and heading well down into record territory. The August storm certainly helped set the new record, but the new record was not caused by the storm alone. It’s an amusing – and rather a horrifying – process watching someone lock themselves away, step by step, rejection by rejection, substitution by substitution, into the lost world of epistemic closure. More on the impact of those long-term weather changes in the far north that that one storm last month has miraculously caused, at least according to those who inhabit the intellectual Land of the Lost. I notice the meme ‘Scientists shouldn’t be pointing out this is a problem, that’s not objective, that isn’t’ is currently big among the Denialati, which is a backhanded acknowledgement that they’ve lost the argument along with the plot. That’s why my blimp uses hydrogen active buoyancy control… 😉 Download the free samples (Kindle, epub) and check out Thunderbird’s tech specs.